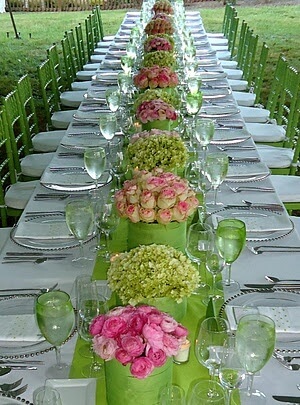 Perfect for a spring or summer wedding, these green and pink wedding tables capture the freshness of the season. This reception took place in an outdoor setting; the green grass made a perfectly coordinated backdrop! Long, long reception tables were created by butting rectangular banquet tables together, end to end. This is becoming a very popular seating option at receptions right now, and it referred to as “Banquet Style”. For a while, this style of seating at a reception was “out” – it was considered rather “pedestrian”, but now its back in – very in. 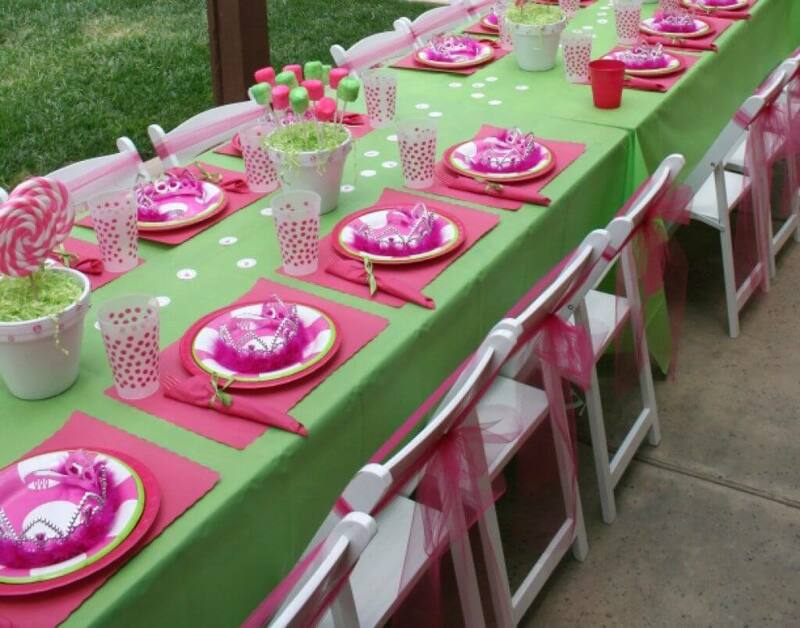 The tables are covered with basic white table covers , followed by a lovely lime green table runner that shoots all the way up the center of the table from one end to the next. 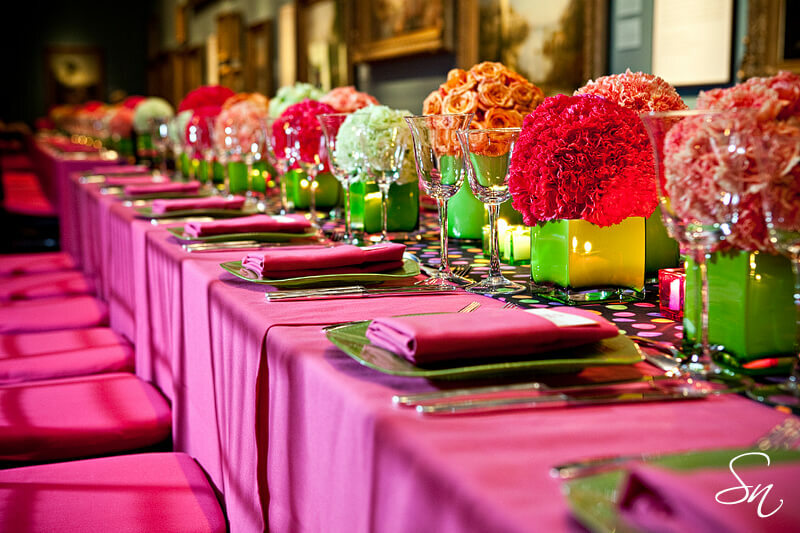 Cylinder containers that have been covered in lime green fabric are lined up across the center of the table, and filled with bundles of spring and summer flowers: roses in a few different shades of pink, alternating with pale yellow / lime green hydrangeas. 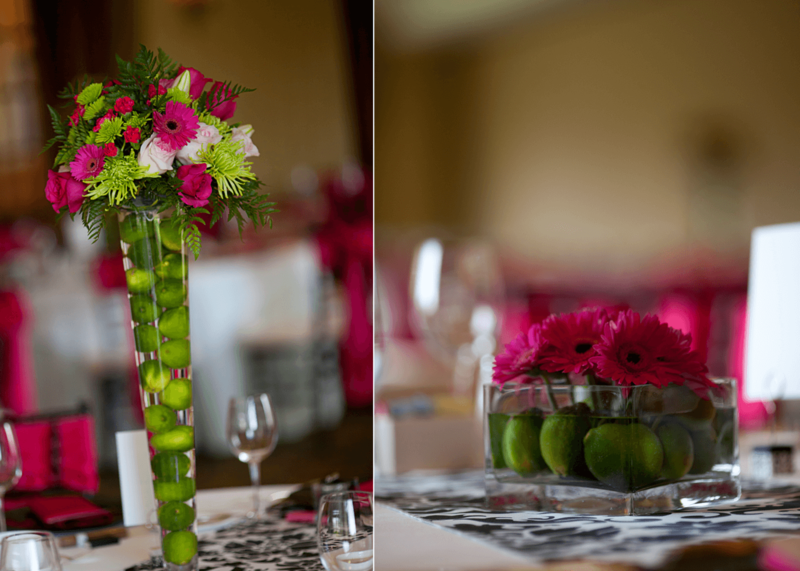 Once again, a lime green table runner is used over a white table cloth, and runs up the center of a long, rectangular reception table. But note that the table runner used in this design is considerably wider than the narrow table runner used in the previous design. So while the dominant color for the table linens in the previous design was white, here it is the reverse – the dominant color is green since the table runners are wide enough to cover almost the entire width of the tables. The white table cloth underneath the runner creates more of a sense of a border. White square shaped plates coordinate nicely with the white table cloth, and are placed on top of the green table runner. 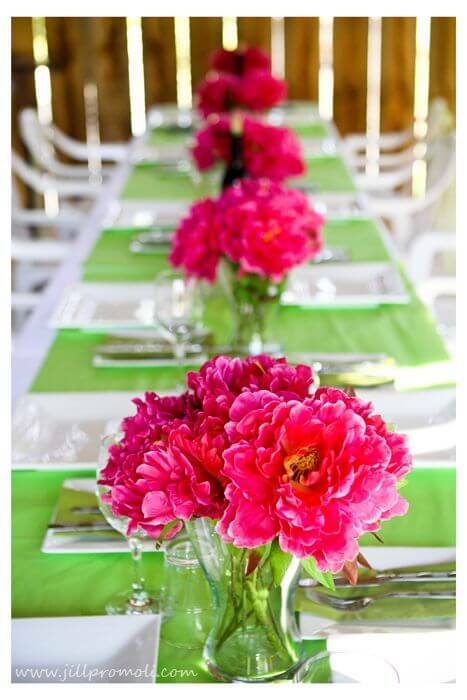 This time the flowers are monochromatic (all one color) – hot pink peonies! They look fabulous against the background of the lime green table runner. The design is so simple – but it looks spectacular! These two colors in combination truly do POP! The colors are vibrant and the mood is energizing and uplifting. A pink and green color scheme is fabulous for a spring or summer wedding. Its fresh, its uplifting – and its FUN. Super-stylish too! At first mention, it might seem like a odd color scheme, some might think unworkable, even. But when you see it in action, as this post proves, it is truly stunning. Its surprising that we don’t see more couples choosing a green and pink wedding color scheme, it really seems to fly below the radar. 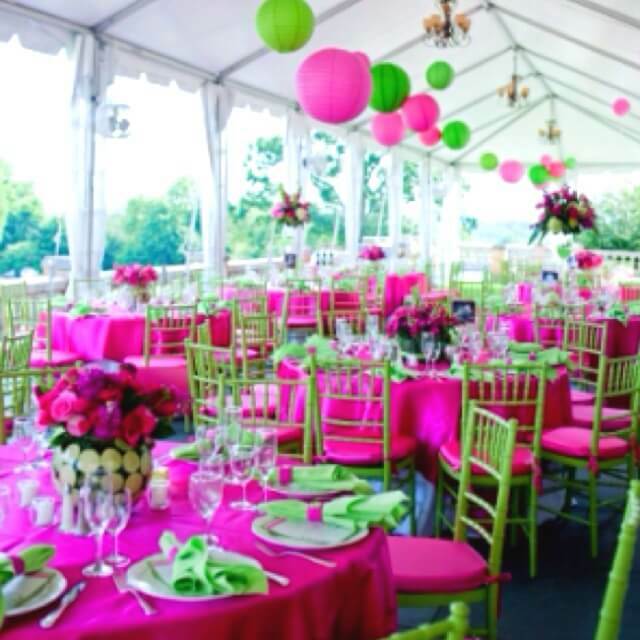 So if you are looking for an opportunity to really wow your guests with something they don’t see all that often, the green and pink wedding color scheme could be just the ticket for you. Keep in mind that you can really get completely different effects ( but equally fabulous) depending on whether you choose to emphasize the green over the pink, or the pink over the green – or if you use the two colors entirely equally. Play around with it a bit and see what you like! Sorry, we don’t have a catalogue – we don’t sell anything; our site is all about giving you great wedding IDEAS, not to try to sell you stuff 🙂 Glad you enjoy the ideas enough to want a catalogue though! Thanks for visiting and please come back often – we feature new wedding ideas ALL the time.